McNeill Mackie Funeral Home has a nearly century long tradition of serving the families of St. Pauls, North Carolina. In the early 1900’s, L.L. 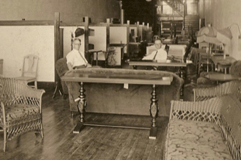 McGoogan and his brother, A.S. McGoogan, began selling caskets in the furniture section of their department store, which was located where the current BB&T Bank is in downtown St. Pauls. By 1923, A.S. McGoogan was operating the full service McGoogan Funeral Home. Following graduation from the Cincinnati College of Embalming in 1956, Lewis McNeill joined the firm. He became a firm partner in 1958 and the company’s name was changed to McGoogan-McNeill Funeral Home. Mr. McNeill purchased the McGoogan interest in the company in 1965, following the untimely death of Mr. A.S. McGoogan, and in 1968 the new McNeill Funeral Home opened at the current location, 319 W. Broad Street. Additionally, in 1968, Mrs. McNeill, the former Sarah Louise McGoogan, earned her North Carolina Funeral Director’s License and joined in the funeral home operations. In service to the community, Mr. McNeill was a two term Mayor of St. Pauls, a Director of United Carolina Bank and the St. Pauls Chamber of Commerce, and a WWII U.S. Navy Veteran. In addition to helping with the funeral business, Mrs. McNeill served St. Pauls Presbyterian Church as Organist and Choir Director for 50 years while raising 4 children. In 1993, Mr. McNeill transferred ownership of the funeral home to The Loewen Group, which at that time was the premier international operator of funeral homes, with corporate headquarters in Vancouver, British Columbia, Canada. Following the funeral home merger, Mr. Harry Carter took the helm of operations and guided McNeill Funeral Homes’ service to St. Pauls’ families. Following a number of changes in corporate ownership, McNeill Funeral Home was acquired in January 2008 by Duncan and Nancy Mackie. Following a 3 year tour of duty with the U.S. Army, Mr. Mackie received his Bachelor of Science in Outdoor Recreation from the University of Colorado in 1978 and spent several years as a Boy Scout Executive in Western Nebraska and St. Paul, MN. He was then the Superintendent of Recreation for Brevard County, FL from 1987 to 1990. He returned to school, receiving an AS degree in Funeral Service from Miami-Dade Community College in 1992 and, after passing the National Funeral Service Exam, he received his Florida Funeral Directors and Embalmers License. Mr. Mackie worked with Kraeer Funeral Homes (a group of 10 funeral homes in South Florida) as funeral home manager, central care manager and lead funeral director. In 2006 he joined Fero Funeral Homes (a 4 funeral home group) in Dunnellon, FL as Funeral Home Manager and Central Care Manager. From 1991 to 2000 Nancy Mackie was the Pre-need contracts fulfillment officer for Security Trust Plans (STP). In this capacity she insured that all preneed funds received were properly accounted for and placed in trust. Additionally, she received and verified all death claims to insure compliance with state and federal law prior to releasing pre-paid funeral expense money to claimant funeral homes. Nancy is currently the OTC (Over The Counter) Pharmacy Manager at the Lumberton Wal-Mart. We look forward to serving the families of St. Pauls and Robeson County.